Earn $5.99 in VIP credit (599 points)What's This? Designed specially for front use, the Yksion Pro GripLink Tire offers maximum control and handling. Mavic's special "S+" added Silica rubber compound grips the road and doesn't let go, inspiring confident corning in wet or dry conditions. A grooved tread delivers exceptional traction in wet or dry conditions. A Kevlar breaker helps prevent punctures without adding extra weight, and the 127 TPI nylon casing ensures a lively ride quality. The Yksion Pro GripLink Tire is available in 700c x 23mm (23-622 ISO) and 700c x 25mm (25-622 ISO). Folding bead. Claimed weight: 190 grams (23mm version). Black with White logos. 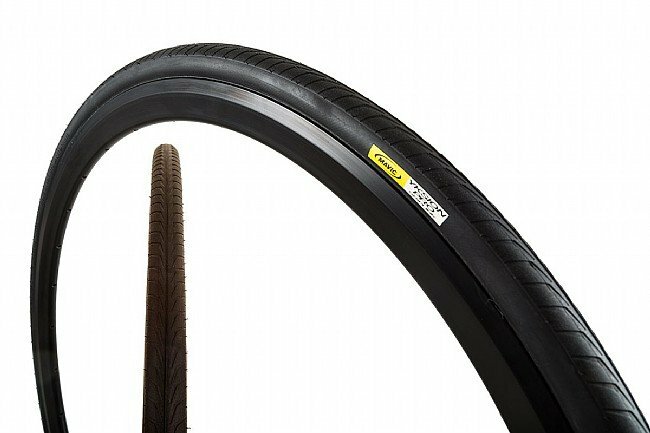 Mavic has specifically optimized this tire to function as a set with the GripLink up front and their PowerLink tire on the rear wheel. 5 of 6 customers found this review helpful. This tyre, or set of tyres, offer a great road feel. Plenty of grip makes cornering smooth and the rider feels in control. Suppleness takes away vibration and they roll really well. I picked up a pinch flat riding on gravel when the tyre was slightly under inflated but otherwise they have performed exceptionally well. 12 of 19 customers found this review helpful. I had no idea what direction to mount these tires in. There was supposed to be an indicator, but there was none. I email Mavic two separate times, and never got a response. I will never buy another Mavic product again! Thanks for your review! Generally speaking, tires with a tread like this should be mounted so that the tread is pointing in the direction that you're traveling. Our customer service department is great with questions like this -- please don't hesitate to get in touch if you ever need help! 1 of 6 customers found this review helpful. 9 of 9 customers found this review helpful. The GripLink and PowerLink tires came with my new Mavic rims. I usually run Continental 4000s tires, so I was a little hesitant about using them. I only have about 300 miles on them so far, so I am still testing. They are being used in Tucson, a place that is notorious for thorns and rough roads. They carried me through the El Tour race with no problems. So far the tires have performed excellent. I liked these tires as soon as I tried them. Nice ride and a good value. Mavic wheels and tires are the best!